colors on wove paper, full margins. Edition of 30. Very rare. Signed, titled, dated and inscribed “Ed 30” in pencil. 15 1/4 x 10 1/8 in. ; 38.74 x 25.72 cm. 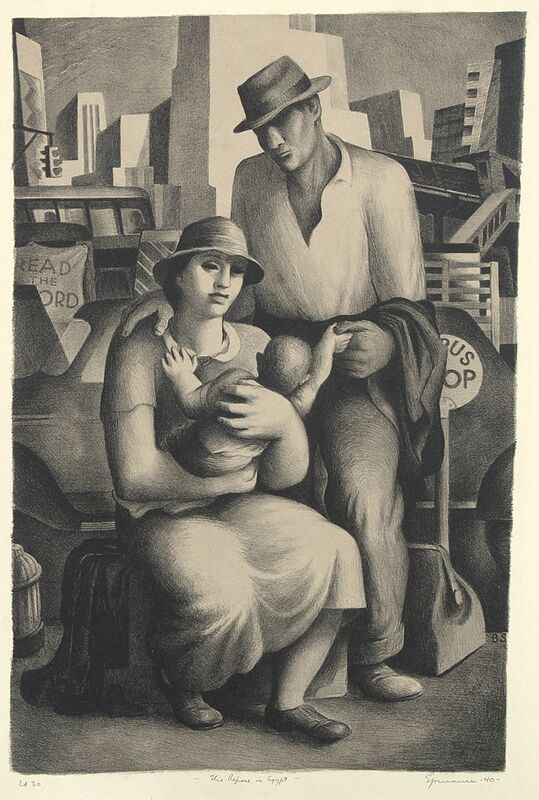 This lithograph printed in two tones is loosely based on the central figures from a 1939 mural. Entitled The Strength of Democracy Abides with the Family, the mural is located in the Municipal Courthouse in Philadelphia at 1801 Vine St. It was not unusual for Spruance to make several interpretations of a theme, and this is a fascinating Depression-era version of the Biblical story,using the subject of migratory farming families.